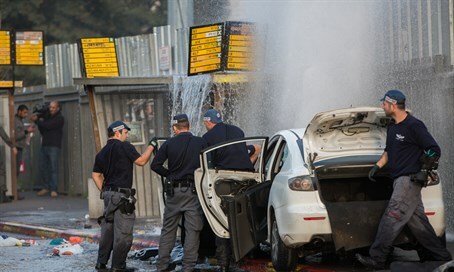 Shortly after the horrific car attack in Jerusalem on Monday, Prime Minister Binyamin Netanyahu held an urgent meeting and decided to place defensive measures against such attacks at roughly 300 bus stations around the capital. Netanyahu held the meeting with Internal Security Minister Gilad Erdan (Likud) and Transportation Minister Yisrael Katz (Likud), and ordered them to carry out the move. The step to secure the bus stations, apparently by placing barriers to block cars, is expected to take a month to complete and cost two million shekels (over half a million dollars). In the attack on a bus stop adjacent from the iconic Chords Bridge, an Arab terrorist from Jerusalem's Beit Hanina neighborhood wounded 14 people including a one-year-old baby, who was seriously wounded and whose leg was almost cut off. Two others, including a 65-year-old woman, were moderately wounded and the rest were lightly wounded. The terrorist was shot dead after exiting the car armed with an ax. "I spoke this evening with Minister Katz and I presented to him a plan to protect hundreds of bus stations in places in high danger," said Jerusalem Mayor Nir Barkat of the plan. Erdan spoke with Channel 2 about the wave of Arab terror, saying, "I don't see an end to the terror wave." The appraisal is troubling, particularly considering it comes after the announced counter-terror move at the bus stops. The plan to place defensive measures at the bus stations brings to mind a move just over a year ago in November 2014, when concrete blocks were placed at light rail stations in the capital after a series of lethal car attacks at various stations. The move was criticized by many as being an acceptance of the terrorism as opposed to taking decisive action to stamp it out. Indeed, while car attacks have reduced at the light rail stations, the stations have been the site of numerous knife attacks since showing how the threat simply evolves without disappearing. In October amid the recent uptick in attacks, Netanyahu ordered and then reversed his order to place a wall dividing Armon Hanatziv and Jabel Mukaber in southeastern Jerusalem. Jerusalem Councilman Arieh King warned that the move gave further expression to how the capital is being divided in practice by Netanyahu and Barkat, and demanded that the Arab majority neighborhoods in the city be given proper law enforcement to cut the danger at its roots.